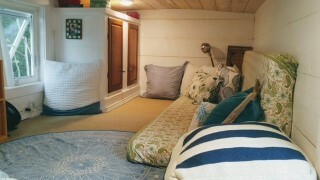 Inside a well built tiny home. "Tiny homes are just like trailers,” some believe. However, the tide is turning as more people understand that tiny homes are anything but today’s mobile homes. Quality, style and expense vary across the country; some tiny homes are built by laymen home builders and others are built by contractors with years of experience. Speaking of the latter, the quality is undeniable, and can be seen and felt with one step over the threshold of a tiny home. mobile home. Simply put, when built by professionals, these homes rival their bigger counterparts; in essence they are their counterparts - only they are tiny. The general the definition of a tiny home is any home that is 400 ft. or less. They can be on wheels and mobile, or not. They can be on the power grid or have a generator that provides power. Some tiny homes are elaborate, designed in such a way that every square inch of space is used to maximize utility; smart design can't be underestimated when we are talking about living in such a small space. Still for other tiny homes, design may be an afterthought, as the owners aren't planning to live in their tiny home, but merely use it as a getaway on the weekends. Why do people choose to live tiny? if built on a trailer, it can serve as a food truck. I had the pleasure of visiting a woman in her tiny home that she built with the help of friends, her motivation was to be able to live without a mortgage, so that she would not have to work a 40-hour work week and could pursue her passion for travel. She wanted a place to call home, and a community to lay down her roots. She found Southern Maine to be just that spot, but it was not without challenges. As with anything new, there were gray areas in terms of living in a town that had not yet adopted codes that addressed tiny homes. They asked her to move. She moved her tiny home and is now living happily in another Southern Maine town. The gray area turned a bit more black and white when just last month, the State adopted new code directed at tiny homes in particular. This makes it easier for towns in Maine to adopt their own policies concerning tiny homes. "This is a big win for the tiny home community" says Corinne Watson, owner of Tiny Homes of Maine LLC. Corinne dreams of the day when clients can come to her and know that there is a well-established path for them to take toward their dream of owning a tiny home. A day when towns are ready to welcome tiny home owners, banks are ready to lend, deeds can be issued, and people can claim their piece of the American dream of home ownership. We aren't quite there yet but change is coming and when it does, it’s going to be BIG, by being tiny. Amy Krikken is an Associate Broker at Better Homes and Gardens/Masiello. She can help you buy or sell a tiny home, or a regular sized one, abkrikken@gmail.com or 207-317-1338.